The Santoku knife originates from Japan, and is considered a general-purpose knife that is comparable to the common Western Chef’s Knife. It is usually less than eight inches long, although some varieties can be found as large as ten inches. What makes the Santoku most distinguishable from its Western counterpart are the key features of a flat edge combined with a sheepsfoot blade, with no knife tip. In addition, the angle near the point of the blade is typically around 60 degrees, while a Chef’s knife might be 40-45 degrees. It is thinner blade as well, but is made of hardened steel to compensate for the thinness of the steel. The word “Santoku” actually means three uses, and refers to the three most common types of cutting the blade is used for: slicing, dicing and mincing. It is not used for bones as it tends to chip due to the thin blade, and it does not cut bread or peel vegetables or fruits particularly well. It is capable of cutting very thin slices, a common use of the Santoku in Japan. The Santoku has several key features that give it a particular cutting style. First, it is known as a well-balanced knife, where the width and weight of the blade are carefully balanced against the width and weight of the handle. Second, due to the sheepsfoot design of the blade, a rocking motion is not used when cutting with this knife, unlike with many Western knives. When searching for the perfect Santoku knife, consider all the individual pieces of the knife, and also how they fit together as a whole. The knife should be lightweight and easy to manage, so that the user can control it and be capable of precise cutting movements. One of the most important factors to look for is balance; if the knife feels well balanced around the handle, greater precision and quicker cutting movements can be achieved. Looking at the individual parts, the handle should feel comfortable in the hand, and be firmly attached to the blade, preferably with three rivets. The blade itself should be steel (although some knives use ceramic instead), as steel will not corrode, is highly durable, and can be easily honed and sharpened to extend the useful life of the blade. It should be sharpened on both sides, as well as contain some sort of channels to prevent food from sticking to the blade. 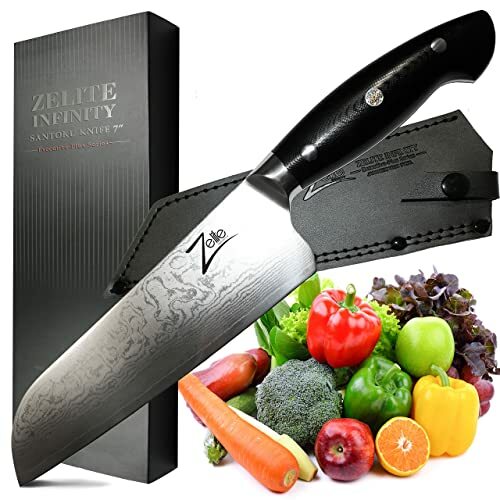 The Zelite Infinity Santoku Knife stands out among the rest not only because of its quality of craftsmanship, but also due to the ornate designs featured on the blade and handle. With a notably deep blade that has been liquid nitrogen cooled, this knife includes an ergonomic handle and leather sheath. With a weight and balance that makes using it a breeze, the Zelite Infinity expertly combines performance and quality manufacturing. Recommended For: Those who want a quality, well-built knife that is also visually unique. The Wusthof Classic Ikon Santoku has many great features; a full tang blade that is double bolstered for control, this knife is well balanced and has a supremely sharp cutting edge that has been tested by the manufacturer. The blade itself is made from high-quality German stainless steel, and is attached to the blade through three rivets. This Santoku knife really shines in the customer service department however; the knife is backed by a lifetime warranty. Recommend For: Those looking for a solid knife with a customer service promise. The Yaxell Gou Santoku Knife has an ice hardened stainless steel blade with a unique Damascus design pattern impressed on the blade itself. The handle, made out of a resin and linen material, is attached to the blade by three rivets. This knife is not however, a full tang, and the weight and balance of the knife may be affected because of it. For those looking for a blade other than the standard seven-inch that is commonly on the market, the Gou comes in a variety of sizes from 3 ½ inches all the way up to 10, making it the knife with the most consumer options. Recommended For: Those looking for a variety of blade sizes to suit all their slicing and mincing needs. The Kessaku Santoku Knife features a stainless steel, full tang blade that has been specially created to resist corrosion and rust. 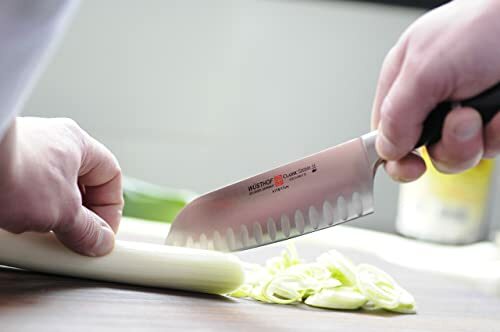 With it’s ergonomic and comfort grip handle, the Kessaku Santoku gives the user greater control over the blade, ensuring a precise cutting process. While the blade has been hardened, it lacks the hardness of a knife that has undergone liquid nitrogen or ice cooled hardening, and therefore is more likely to chip or break during use. Recommended For: Those who are interested in an ergonomic design that is particularly resistant to corrosion. The Victorinox Swiss Classic Santoku Knife was chosen as one of the top five due to its unique handle design. Not only is the handle ergonomic, but it is textured and slip-resistant to ensure a firm grip and fine control over any slicing, dicing and mincing you might do. The knife is also extremely lightweight at 4.6 ounces, making it a dream to handle during food preparation. The knife is well balanced, and while the blade might not be as well manufactured as some of its counterparts, it is a unique knife that will perform well in the kitchen. Recommended for: Those with difficulty gripping or controlling knives, who need a specialty handle. Q: What is a Santoku knife used for? Santoku means “three uses”; it is typically using for slicing, dicing and mincing anything other than bread or bone. It can be used to create very thin slices of food, a common item in Japanese culture, but it does not excel at peeling fruits or vegetables. Q: Can Santoku knives be made with ceramic? Yes, although ceramic is not as durable as hardened steel and is susceptible to cracking. In addition, while ceramic is very sharp, once it loses its edge, they are almost impossible to sharpen at home and often the useful life of the knife is over. Q: Are these knives dishwasher safe? Unless specified by the manufacturer, Santoku knives should be hand-washed only. Q: What should I avoid cutting with a Santoku knife? Santoku knives, due to the knife edge, are susceptible to chipping on bone, so they should not be used for this purpose. While bread will not chip the knife, the Santoku is ineffectual at cutting it and so should be avoided. It also does not excel at peeling fruit or vegetables. Whether you prioritize comfort or functionality, the visual display of the blade or the versatility of it, there are a number of Santoku knives on the market for every slicing, dicing and mincing need. 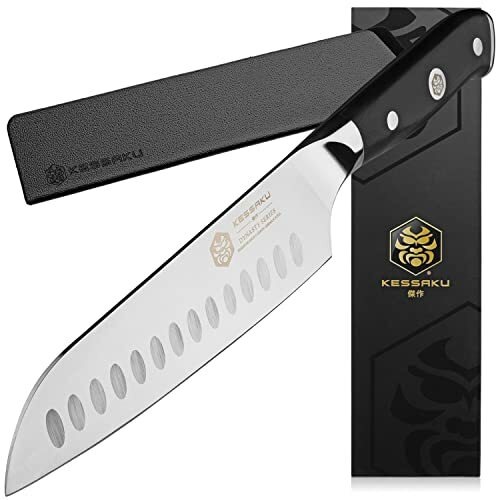 As long as the knife is lightweight and balanced, the handle is well attached to the blade, and the blade is sharp, the Santoku knife will fulfill all of your general-purpose cutting needs in the kitchen.